With the exception of risk and crisis management, corporate communications has been the laggard cousin in using the social web as a strategy. Marketers were quicker to recognize social’s worth in touting products and services. But the branch of communications that is “dedicated to the dissemination of information to key constituencies, the execution of corporate strategy and the development of messages for a variety of purposes for inside and outside the organisation” (Financial Times) has dawdled or, generously, been deliberative. 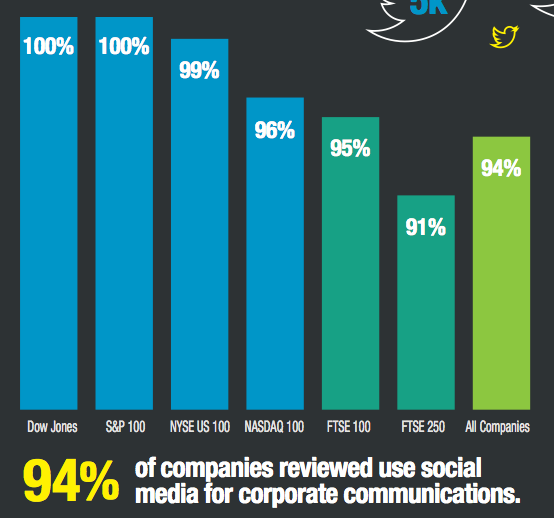 Yet an extensive review of corporate social media by the digital IR and corporate communications consultancy Investis finds that leading public companies are responding to social’s potential. In fact, there is now “a gap in quality and performance” opening up between public companies in terms of how they use social for corporate communications goals. Out of a score of 100, the poorest performing sectors in the use of social for corporate communications are basic resources (17) and equity/non-equity investments (8). The latter is not so shocking given privacy concerns: But the former is troublesome given the acknowledged advantages of social in engagement and driving traffic to websites and content hubs, both of which are (or should be) an aspect of a resource company’s stakeholder strategy. 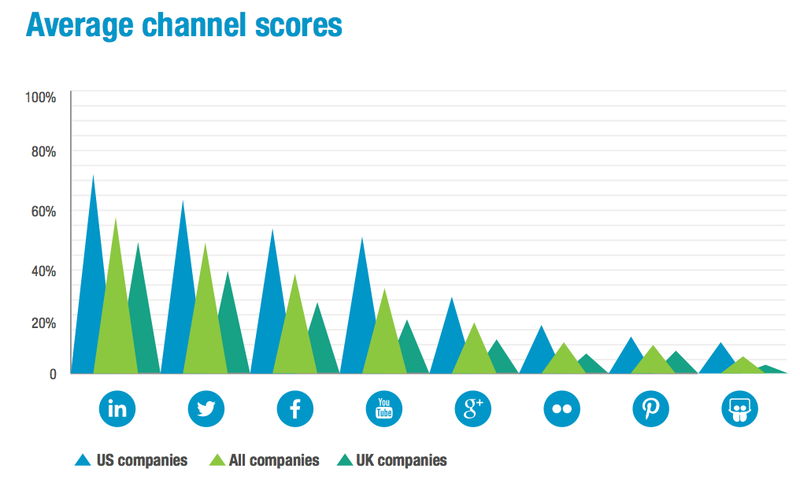 Hardly surprising, Linkedin ranks as the most popular channel for corporate communications purposes, “with 93% of all companies actively maintaining a Linkedin account.” Of note, Linkedin is the biggest source of referrals to corporate websites. More Twitter facts—Twitter ranks second to Linkedin as the preferred platform, 93% of the companies in the study use hashtags, 90% retweet third party comments, and 59% respond to direct queries. And how’s Pinterest doing? Well, only 28% of companies use Pinterest for corporate marketing, with only 3.0% of the FTSE 350 doing so. Companies that respond to Facebook wall posts get an average of 52,544 likes compared to an average of only 3,137 for those who don’t! The Financial Times definition of corporate communications leans heavily on the idea that communications is about ‘push’. Nothing about it implies interaction like discussion or consultation. (There is) hard evidence that those companies that genuinely engage with the social audience and that commit to regular, high-volume output are rewarded by higher views and greater engagement and interaction on their accounts and channels. Now let’s just get those investment and resource companies moving. This blog post was originally published by our senior digital strategist Boyd Neil on his personal website on February 17, 2015.